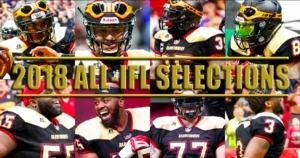 DES MOINES – Concluding the 2018 Indoor Football League regular season, a record eight Iowa Barnstormers players have been selected to All-IFL teams, the league announced today. Quarterback Drew Powell, wide receiver Brady Roland, linebacker Zach Allen, defensive back Bryce Enyard, and defensive lineman Keith Jones, Jr. earned First Team selection, while offensive lineman Ken Van Heule, offensive linemen Brandon Haskin, and defensive back Jourdan Wickliffe were named to the Second Team. After a successful 2017 season gave the Barnstormers their first playoff appearance in 8 years, the team kept the momentum going into the 2018 season, finishing 13-3 and in first place in the Indoor Football League. They are one of three teams to have eight All-IFL selections. Drew Powell (6’3, 220, Livingstone College) earns First Team Selection for the Iowa Barnstormers after leading the IFL in rushing (945) and passing for 34 touchdowns in 2018. Brady Roland (6’2, 185, Grand View University) earns First Team Selection for the third consecutive season, having also earned Second Team honors in 2015. Zach Allen (6’2, 240, Wake Forest) earns First Team Selection after leading the IFL’s top ranked defense to the Championship game. Allen completed the 2018 season with 72 total tackles, two pass breakups, and 1.5 sacks. Bryce Enyard (6’0, 195, Northwest Missouri State) earned First Team Selection after a dominating season where he collected 69 total tackles, 13 pass breakups, and 8 interceptions. Keith Jones, Jr. (6’1, 310, University of Tennessee - Martin) also earned First Team Selection, finishing the 2018 regular season with 21.5 total tackles and 4.5 sacks. Ken Van Heule (6’4, 310, Midwestern State) and Brandon Haskin (6’4, 315, Tennessee State) both earned Second Team Selection after contributing to a powerful offensive line. Jourdan Wickliffe (6’1, 205, Eastern Illinois University) earned Second Team Selection, finishing the season with 50.5 total tackles, six pass breakups, and three interceptions.